T&T Scientific wins Startup Day 2016 Pitch Competition. Receives $5,000 cash prize, presented by Three Roots Capital and SouthEast Bank. 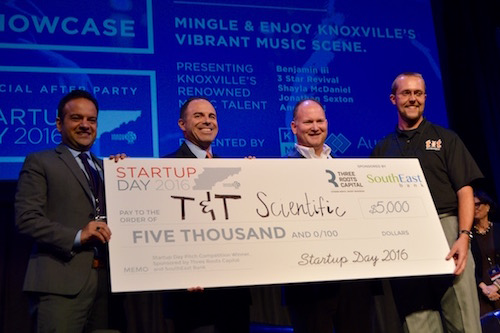 KNOXVILLE, Tenn. – Graham Taylor with T&T Scientific claimed the winning pitch prize during Startup Day 2016 on Thursday, September 22, 2016 on the U.S. Cellular Stage at The Bijou Theatre in Downtown Knoxville. "Graham Taylor exemplifies the entrepreneurial spirit that defines Startup Day and makes Knoxville such a great place to grow a business. It is truly an honor to bestow this prize on T&T Scientific, and I am excited to see where the future leads them," said Monty Montgomery, President of SouthEast Bank. Judges David Kereiakes, Senior Associate, River Cities Capital Funds; Sue Malone, President, Strategies for Small Businesses; and Tony Shipley, Chairman and Co-Founder, Queen City Angels, scored all presentations on a variety of criteria including value proposition, market and sales strategy, distinctive competence, and growth potential. "Startup Day's Pitch Competition showcased some of the best entrepreneurial talent that East Tennessee has to offer," said Grady Vanderhoofven, President and CEO of Three Roots Capital and co-presenter of the $5,000 prize. "I commend all of the entrepreneurs for their hard work and vision, and look forward to seeing them grow their businesses." All six startups received a one-year subscription to FundingSages' TurboFunder Platform, which provides entrepreneurs information, resources, and tools to guide them through the creation and development of an investable company.